Candy buffets are an excellent way to give your guests their sugar fix without the stress of a fancy dessert. We especially love them for their versatility and the way that you can customize them for any event. Keep reading for some helpful hints and tricks to make your buffet a success. What Colors Should my Candy Buffet be? A black-and-white theme works well for formal or adult soirees. Keep in mind that this option may limit the types of candy you’re able to use. Your best bet is a diversity of chocolates in milk, dark and white. If you’re throwing a kid’s party, a rainbow color scheme is a fun choice. The benefit of this theme is that you can use any candy you want, while the downside is that your buffet risks looking visually cluttered or overwhelming. For a get-together happening in spring or early summer, pastels are a timely option. Plenty of light-hued candies should be available in the months surrounding Easter and they look darling displayed together. For a buffet that stands out in the best way, choose a couple dark or saturated colors to feature. You can look for candy-coated chocolates and jumbo lollipops in color-drenched hues. Brightly colored candies look great, but can melt and cause unsightly stains. If you’re using a light-colored tablecloth, be cautious! After all of the work you’ve put into selecting a color, don’t disguise it! Use clear dishware so your candy is fully on display. Just because you’ve selected one or two colors to feature doesn’t mean you can’t use other colors as an accent. Just use them sparingly! 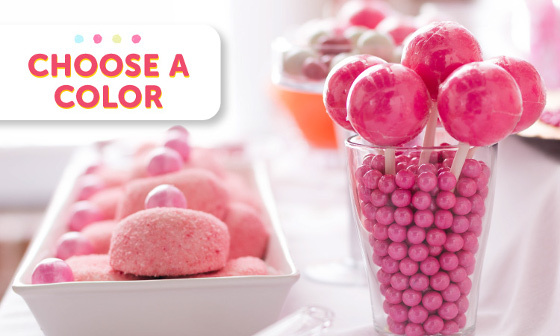 If you have candies in different shades of the same color, try mixing them to add visual interest. What Types of Candy Should I Purchase? The coolest candy buffets have sweets in a variety of shapes, sizes and textures. Choose your goodies accordingly, while staying mindful of guest preferences. You should plan on purchasing about eight ounces of candy per guest. For things like lollipops, one per guest should be plenty. For the most cost-effective solution, try buying your candy in bulk. Try purchasing at least one “filler” candy that can be used as a base or prop for other candies. We chose small chocolate balls for this purpose. In order to add visual interest (and provide an option for guests who aren’t candy fans), try adding a small cake to your display. If you’re ordering your candy online, delay shipment until right before your party for freshness and less chance of melting. Similarly, keep your candy in a cool location and out of the sun for the duration of the party. Don’t forget something for guests to put their candy in! Colorful bowls, cellophane bags, or Chinese-style takeout boxes work well. Whenever possible, set up your candy so that guests cannot touch the part that’s being eaten. This means leaving wrappers on individual candies and displaying sweets like rock candy with the stick facing up. How do I Set up my Candy Buffet? The weight of bulk candy and displayware adds up quickly. This is not a job for a small card table. Most buffets benefit from a tablecloth. Find one in a color that matches your candy, or keep it neutral with white. We suggest a tablecloth that is larger than your table. The excess material can be draped over pedestals to keep the look cohesive. If you’re using an accent color, choose details for the table in a matching tone. We included a gold banner. Because your candy display will inevitably feature tall containers, guests’ eyes will also be drawn to the walls behind them. A simple backdrop in coordinating colors is enough to keep things pretty. We used circular paper fans on our wall. You can also use streamers, garland, paper lanterns, balloons, or even your favorite paintings and posters for a background. If you feel like getting crafty, colorful paper plates twisted in cellophane look like giant hard candies. You may not have enough tall containers on hand for your buffet. Even if you do, a pedestal is still a useful tool. It can be used to elevate a bowl, vase or jar to add another dimension to the table. While you can purchase a pedestal specifically for this purpose, an inverted box, brick, book or dishware works just as well. Cover it with your tablecloth so it’s not visually distracting. Because a candy buffet shouldn’t be composed of all the same types of containers, you’re encouraged to use what’s on hand. Here are some common container ideas. You can use mason jars, large lidded jars, vases, bowls, trays and cake stands. To avoid too much visual chaos, you may want to keep things symmetrical by using the same type of storage containers on either side of your buffet. 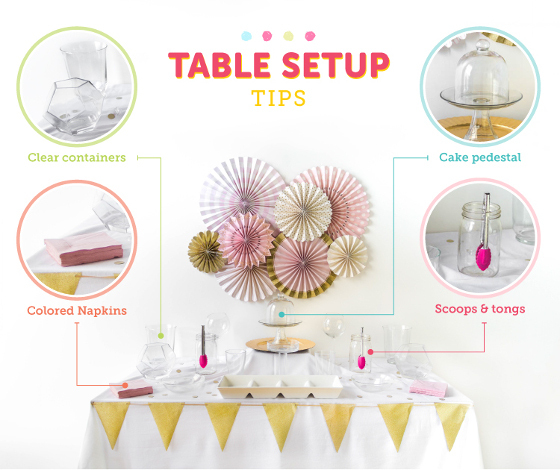 Create a point of interest by elevating one container of candy (or cake) above the others. Don’t be afraid to mix candy in containers. Filler candy can be used at the bottom of large jugs and jars to make other candy easier to reach. Avoid using excessively tall containers in the back of your display. They may be too hard to reach. For the same reason, avoid containers that do not have a wide mouth or are otherwise difficult to reach into. While the containers should be full enough to look plentiful, avoid filling all the way to the brim. It could cause spilling. While we’ve suggested glass in this article for its translucent appeal, keep your guests in mind. If you have children at your party (or clumsy adults!) breakable servingware may not be advisable. For hygiene purposes, you should set up the candy so that guests are touching it as little as possible. 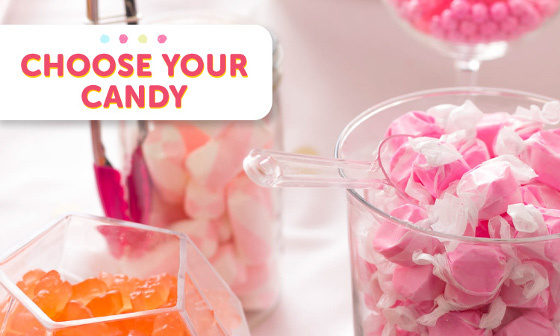 Provide tongs and candy scoops for bulk candies in a color that complements your theme. Smaller serving implements are preferable; you don’t want your guests to overdose on sugar! If you have candy that is soft, squishy or fragile, tongs are less likely to smash it than a candy scoop. How do I Decorate my Candy Buffet? 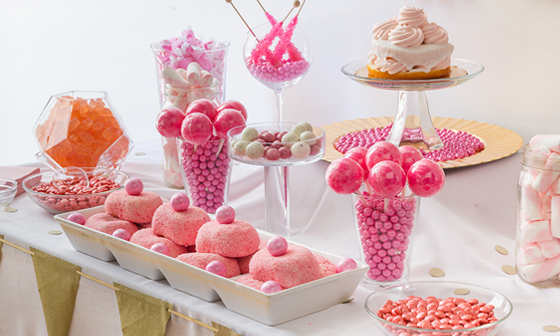 For a candy buffet that’s unique to your party, don’t shy away from extras. Confetti, ribbons, garlands or even cute plush animals make an excellent addition to the table. However, less is more, so a couple finishing touches are all you need. If you’ve created a candy buffet to celebrate someone special, try featuring their name in foam letters with colorful candies glued on top. You can tuck party blowers into tubs of candy for a birthday party, or scatter ornaments on the table for a holiday celebration. The choice is up to you! 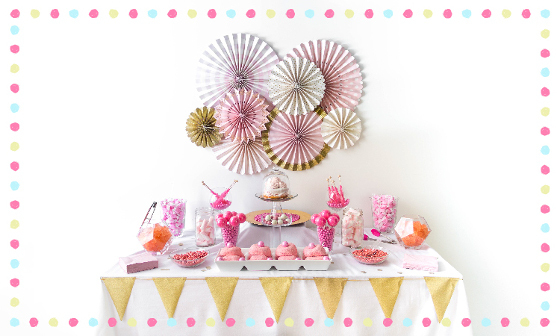 Now that you’ve got some fun candy buffet table ideas, we hope you feel inspired! If you follow these tips and have fun with it, your display will inevitably be a success. For a perfect centerpiece to your buffet, try one of our candy and chocolate gifts. Wishing you sweet success with your setup! Infographic generously provided by Shari's Berries.